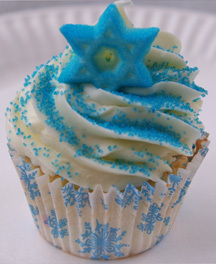 Blue sugar and a Star of David made of sugar top off this Hanukkah cupcake. Or, serve them at bar and bat mitzvahs, or religious school parties. What You Need: 1 cupcake; white or vanilla frosting; blue sugar sprinkles; Star of David edible topper (I got mine from Kake Kreations); 1M metal tip; pasty bag. How to Make It: Fit pastry bag with 1M swirl tip, and make a 1M swirl. Immediately sprinkle with blue sugar and top with Star of David. This entry was posted on Saturday, December 12th, 2009 at 11:42 am	and is filed under Hanukkah cupcakes. You can follow any responses to this entry through the RSS 2.0 feed. Responses are currently closed, but you can trackback from your own site.